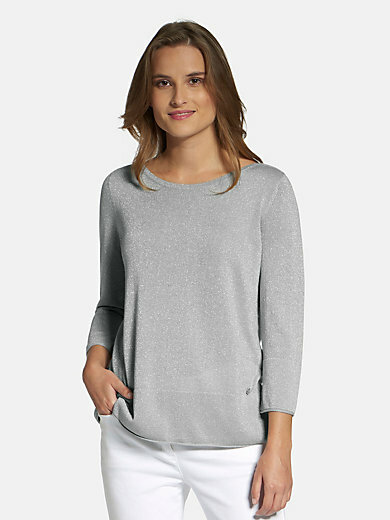 Round neck jumper by BASLER with 3/4-length sleeves and boat neck. The fashionable trend in knitwear made of a fine material with fine glittering yarn. It goes perfectly with elegant outfits and gives sporty casual looks an on-trend touch. Casual style with rolled edges on the wide cuffs and hem. Made of 74% viscose, 26% polyester. Length approx. 23ins. The round neck jumper is machine washable.